Target’s mobile app strategy will undergo a significant change, starting this summer. The retailer announced this week it will soon combine the functionality of its Cartwheel savings app with its main shopping app, in preparation for an eventual Cartwheel shutdown. The Target app will also receive a notable upgrade this year, adding support for an indoor map that shows your location in the store, along with the nearby Cartwheel deals, in addition to support for mobile payments. According to Target, the decision to merge its apps into one is a result of customer feedback. Shoppers wanted an easier way to access all of what Target has to offer from one destination, not two. Target isn’t the only retailer to streamline its mobile app strategy. A couple of years ago, Ebay shut down its wider suite of apps (Fashion, Motors, and Valet), to return their functionality to Ebay’s main app, for example. Meanwhile, other retailers like Walmart, Kohl’s, and CVS – all of which have their own mobile payments service – offer their payments and savings features within their main shopping app, not in a separate one. The retailer had announced its plans to launch a mobile payments service earlier this year, but had not revealed when that would be beyond sometime “this year.” That’s still the ETA for the mobile payments portion of this transition – and, in fact, it could be pushed back to January, if the team needs the time. We also already knew that Target’s initial entry into this space would be focused on supporting its Target REDcard holders, rather than a broader strategy that would allow for other forms of payment. The REDcard is Target’s own credit card, offering shoppers 5 percent off of all their purchases. The company declined to say how many cardholders it has, but noted they accounted for 24 percent of last year’s sales. With Cartwheel, consumers today add deals to an in-app shopping list, then show their barcode at checkout to save on the items they’ve purchased that match the available discounts. Following Cartwheel’s integration with the main Target app, this process will continue – except that, with support for mobile payments, shoppers will be able to both save and pay by having that barcode scanned just once. The transition to the main Target app has already begun. Customers can now access their Cartwheel deals in the main app, even though the standalone version of Cartwheel has not been shut down. We understand that Target has no immediate plans to close Cartwheel, instead favoring a slower transition for this app, which is the more popular of the two. Cartwheel has been downloaded around 40 million times, and its users have saved around a billion dollars via its deals. That’s up from the $600 million reported last year. However, Target says it will soon begin alerting Cartwheel users to make the switch to the Target app through notifications. 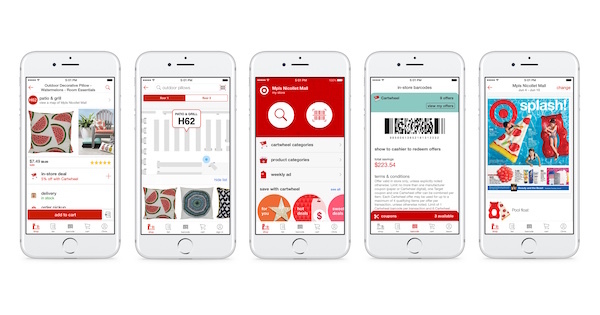 Following the transition of Cartwheel to Target, the main app will be updated with other features, including mobile payments and the in-app map. This map will now show a user’s location in the store as a blue dot, and it will display which Cartwheel deals are nearby. This addresses one of the disconnects between using the Cartwheel app today, and actually shopping the store shelves. You can only see that you’ve added deals to your list, but it doesn’t show their exact location. The deals aren’t even organized in your list by type or aisle number, meaning you have to have a pretty good memory of what you wanted while actually placing items in your cart at the store. Though Target’s main app has offered a store map and aisle finder functionality for years, the ability for it to track your location and show you deals – which will begin rolling out this summer – are new. We understand that location-tracking will be enabled through the use bluetooth beacons. Beacons, which use bluetooth for positioning, are how the Target app will be able to provide a GPS-like experience for its app’s indoor map. That’s something Target began testing a couple of years ago, in partnership with beacon provider Estimote. That test wrapped up some time ago, we understand. Instead, Target is updating all stores with new, energy-efficient LED lighting, and will be installing fixtures that have beacons built in. The company isn’t disclosing the name of its vendor partners, but may be working with more than one on this effort. The plan is to have several hundred stores updated with the beacon-enabled LED lights this summer, and the full chain by the holidays. Presumably, once Target’s main app becomes the de facto location for shopping in-store, online, finding deals, and making payments, it could then be updated to include other newer features, if Target chose. One of those potentially could be support for its next-day home delivery service, Target Restock, which will also launch a pilot test this summer.